The MT6550’s rugged housing is sealed to IP54 standards for protection against dust and water and withstands 1.2m drops to concrete. The NLS-MT65 provides a full-shift battery life of up to 10 hours. 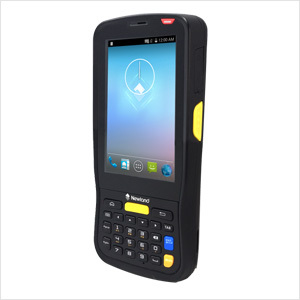 Armed with Newland’s fifth-generation of UIMG technology, the MT6550 can decode even poor quality barcodes, such as soiled or wrinkled barcodes, with ease. The value-added features of the MT6550, including application protection and admin tools, seek to shore up Android’s data security. The NLS-MT65 offers Bluetooth/ WiFi/ 4G/ 3G/ GPS/ Camera functionalities to meet various application needs. Logistics, express delivery services, warehouse management, retail chains, food traceability, healthcare, distributor management, manufacturing, electricity meter reading, inventory counting. All major 1D symbologies, PDF417, QR Code, Data Matrix, etc. Charging cradle, battery, AC adapter, cable, wrist strap, shoulder strap, scanner pistol grip. For a complete listing of all supported bar code symbologies, please refer to the user guide.